In this sales job I’m trying, I’m talking to a lot of fashion companies. To be honest, I really cannot communicate with the people who work there. We really are on different wavelengths. Actually it’s more like, totally different galaxies. Like, I really don’t understand why someone would pay £100 for a t-shirt. That’s enough to feed a village in Africa for a week. Or enough for train tickets for a few trips to the countryside. Or you could get a return flight to anywhere in Europe for that. Maybe I’m a Philistine or stupid, and don’t understand these things. Some people in certain circles are obsessed by image and fitting-in perhaps. But even still, it seems stupid. Another thing, is that all these brands are the same. Well, at least to a silly outsider like me. You could totally make your own brand. So, running with that idea – here’s one I made earlier. First of all, it’s not Vicky Poll-ard. 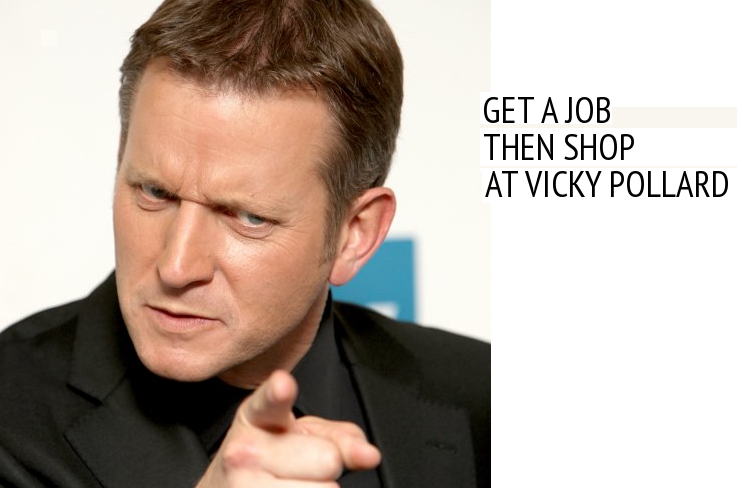 It’s Vicky Poll-aaaaahrrd. Think of Hyacinth Bucket – or as she’d prefer to be known Mrs Bouquet. The thing is – all these other brands are so homogeneous and interchangeable. They all have the same design style, the same clothes and the same moody pouting models. Wouldn’t it make sense to shake things up a bit? Why don’t we get Britain most famous chav to launch her own range. It’s only a thought… but does anybody want to create a mini business venture, doing this? If so, get in touch.